Twenty posing on her firetruck. 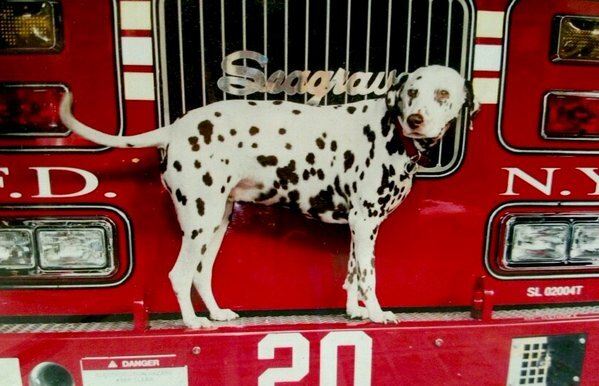 Photo courtesy of @FDNY "...Twenty became a spotted symbol of healing for the firefighters and a local celebrity in the bustling, tourist-filled neighborhood." This is not a sad tale. The beautiful spotted Dalmatian named Twenty, lived to be over 14, and during those years, served her firehouse with love and gusto. She always had a job to do, whether it was comforting the firefighters after their devastating losses at the Twin Towers on 9/11, to riding in the truck to every fire and emergency in her own seat with its own window: "For 10 years she never missed a run," said one member of Ladder Twenty, a firehouse in Manhattan which lost seven of its members to the attacks of 9/11. Twenty gave more than can be put into words, but this article aptly titled, Firehouse Loses Spotted Symbol of Healing in today's Times, does a good job of memorializing Twenty, who died of old age this past Tuesday. I read about Twenty and absolutely love this story. She was a true hero and obviously gave so much of herself to those around her - as all dogs do in their own special ways.